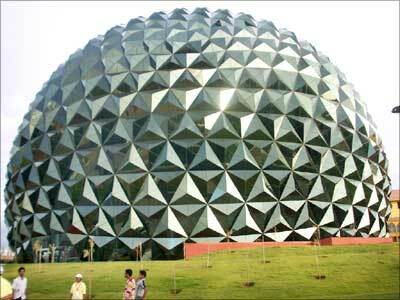 It's not just a change of name for Infosys Technologies, India's second largest information technology services firm, to Infosys Ltd. The company is in the process of becoming a global consulting and system integration major, with the capability of competing for large transformation deals which it was hitherto not capable of. This will give the company the ability to chase and win large business transformation deals of about $400 million as compared to about $80-130 mn at present, said its chief operating officer, S D Shibulal. "Our ability to win deals in business transformation space has changed dramatically over the years. "Five years ago, it was quite easy for us to win a transformation deal of $20-30 mn. "Today, we will easily win a deal between $80-120 mn. "It is difficult to win a transformation deal of $400 mn today. But this journey we have embarked upon will take us there," said Shibulal, talking about company's next phase,which it dubs Infosys 3.0. Transformation deals are contracts where a system integrator tries to solve specific business problems of a client so as to help it achieve growth objectives. The clients come to the SI with the specific business problem(s), rather than requesting it to implement specific technologies. In the next phase, they work with the SI to define the problems with the help of consultants, who are basically domain experts. In such contracts, the vendors mostly work on a risk-reward sharing basis with clients on the business outcomes. 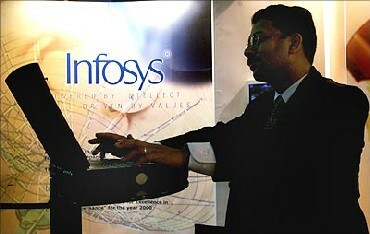 Infosys today derives close to 25 per cent of its revenues from these kinds of deals. "Our revenue from business transformation contracts is about 25 per cent today, and the focus will be to increase the revenue in basically two dimensions -- to increase the percentage of revenue and to increase the size of the opportunities we pursue," added Shibulal. "Even today, when we go after business transformation works, we compete mostly with global SIs. "I am not saying the Indian SIs don't compete with us at all, but there are not that many Indian SIs we see in that space," he added. 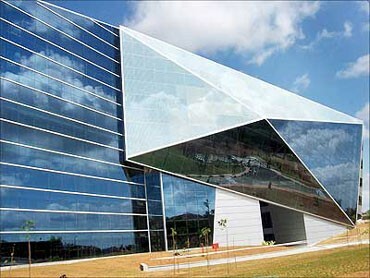 As the share of business transformation contracts goes up, Infosys plans to grow its number of consultants by almost five times to about 10,000 in the next three-five years. In the next phase, it is projecting itself as a 'Global system integration and consulting corporation'. 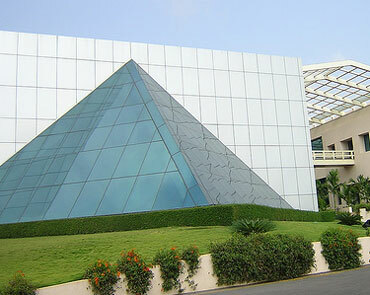 Infosys today employs over 2,000 consultants, including those who work with its subsidiary, Infosys Consulting. The company is hiring about 1,000 consultants this year in the US alone, the process expected to take about a year. "We want to accelerate this, to have about 10,000 consultants in the next three to five years," he said. Consultants are the most sought-after professionals in the IT industry, who are instrumental in bringing business to the company by interacting with senior management of the clients. 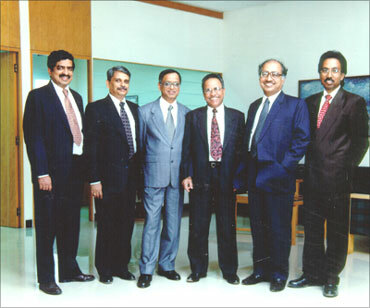 Image: L-R:Nandan Nilekani, S Gopalakrishnan, N R Narayana Murthy, K Dinesh, N S Raghavan and S D Shibulal. 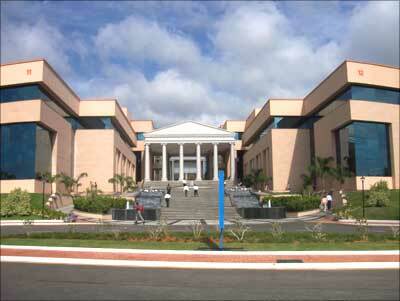 The Infosys Leadership Institute at the company's Mysore campus. "Because of their domain knowledge, they are also billed higher than software professionals. While a typical consultant is billed at $150-$200 per hour, software engineers are billed at $75-80 per hour onsite and $25 per hour in offshore locations. "Consulting always has a higher billing rate," agrees Shibulal. But will this help the company to maintain a better profitability and margin? Shibulal said the aspiration had always been to grow above the industry average and maintain the leading margin. "We believe our new strategy will allow us to grow and our aspiration is to grow above the industry average," he said. 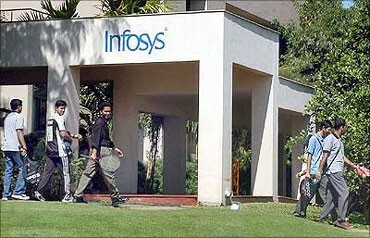 He is not so concerned about the fewer number of clients the company has when compared with its Indian peers. "Our strategy is to go after Global 2,000 customers. We believe the quality of the clients are as important as the number," he added. As of the end of March, Infosys had 620 active clients, with two of them contributing a little over $200 million and 11 of them contributing $100 million to overall revenue.